Made in the USA with real American, USA-sourced chicken, these 100% natural dog treats are the perfect everyday treat for your everyday amazing dog. 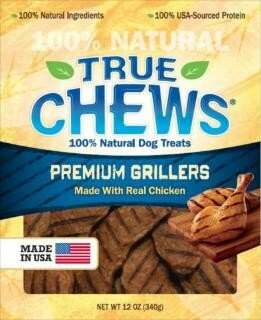 True Chews® Premium Grillers Dog Treats contain no corn, wheat or soy, no animal by-products, no artificial flavors or artificial preservatives. Available in 12 oz. resealable pouches. Chicken, ground rice, vegetable glycerin, dried cane syrup, natural flavors, salt, distilled vinegar, natural smoke flavor, colored with paprika.